It is official, I am a Melonheadz Addict! I also like and use other clipart, but is very exciting to be apart of the Melonheadz club! 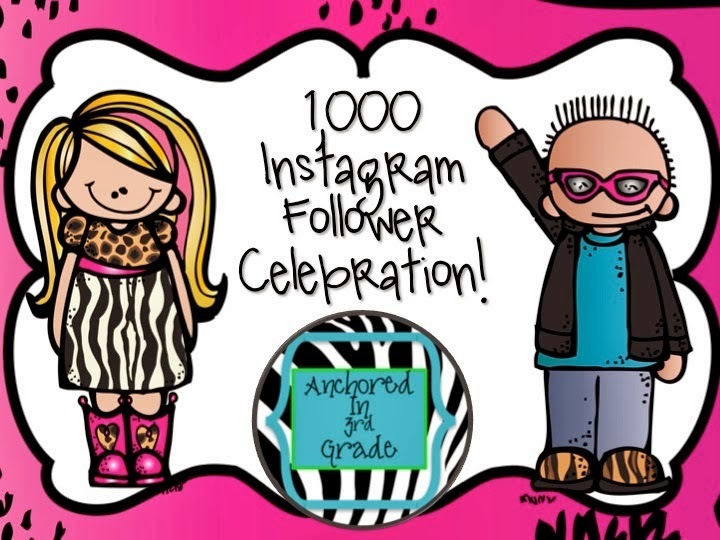 Carrie over at Anchored In 3rd Grade is having a 1,000 Instagram Followers Giveaway!!! She is giving away so many items, it is just great. There are 4 giveaways to win! I even donated one of my items to her for her celebration. 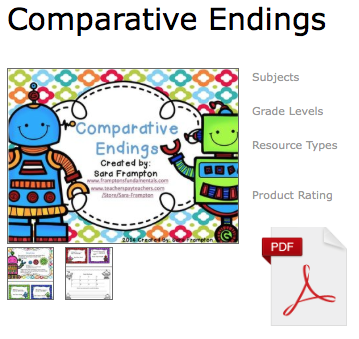 You can win my Comparative Endings activity! 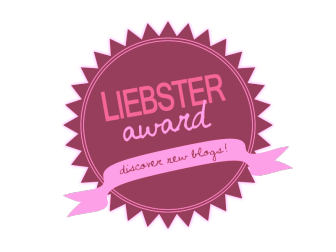 This is my first time participating in a giveaway and I am so proud to be a part of it! 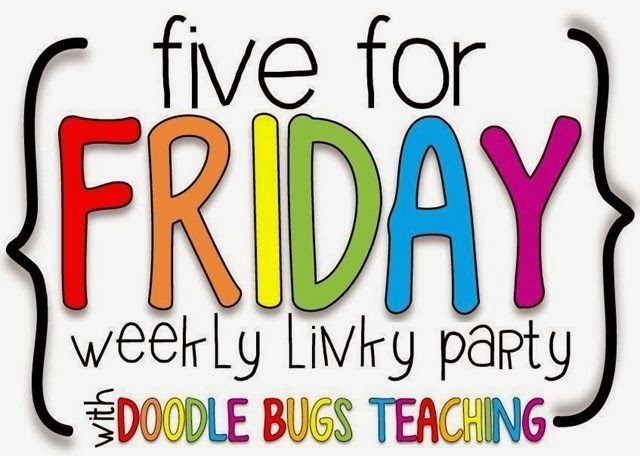 This weeks Five for Friday with Doodlebugs teaching is going to have to be a quick one, I pinched some nerves in my neck and it hurts to type. We had fun this week so I just had to share, even with the pain. 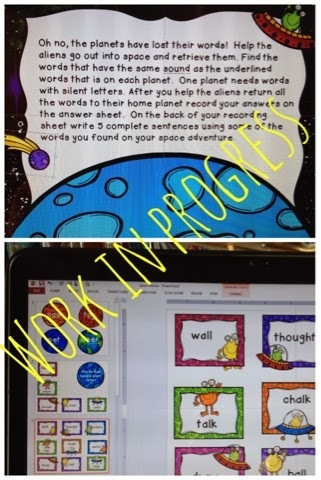 We had our Unit test this week, so I made a fun space sort activity with all of the phonics sounds we worked with during the unit. I have changed the words to make it an r-controlled vowel sort, hopefully I will be able to get it up this weekend. Tuesday I had after care and if finally felt like Spring. We had the kids outside for over 2 hours, these 2 gentlemen needed a rest at one point. They were too cute! Unfortunately the next day the temperature was back to being in the low 30's and we had ice again on Thursday. But we are enjoying the sunshine when we can! 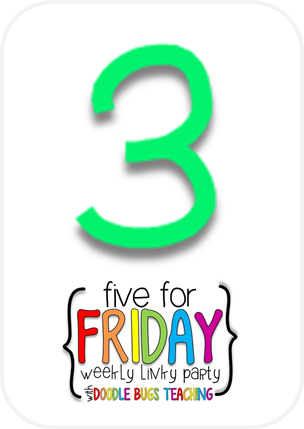 With the Unit test there are no Reading workbook pages or stories, we used the extra time to really go over each part of the Daily Five. We took one part every day and really went over and practiced the expectations again. I think it is important to do this every once in a while and Unit test week just seems like the perfect time for a refresher. 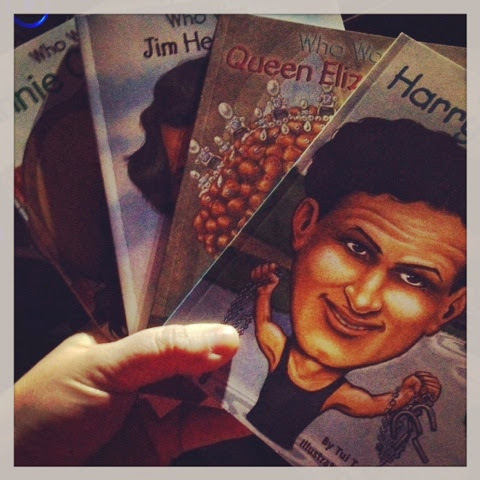 We just love the books from the Who Was series! I bought some more on Tuesday night, and the new ones that came out on Thursday, I bought those too! I just love how into them my kids are this year. They keep bringing up facts about the people and events they are reading about, they are even comparing them to other people they are reading about. I love hearing them discuss these facts randomly over lunch! I just wish I heard about this book series sooner! Needless to say I NEEDED to encourage this behavior farther! In these pictures you will see the start of our timeline. We are taking our giant board in the back and tuning it into a time line of the people in the books we currently have. As we get more books we will add to the time line. I wrote each name down and my friends went to the time lines in the books and wrote down when they all were born and when they died. 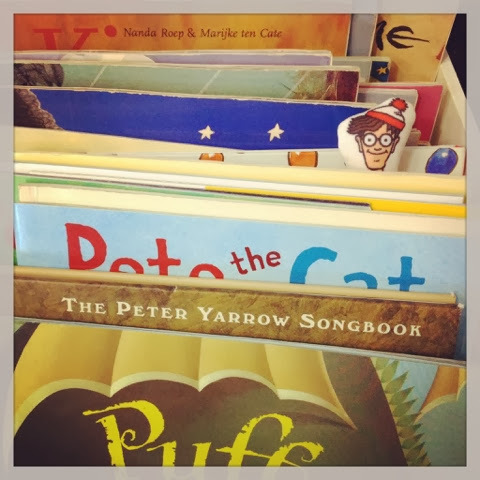 Currently we have over 60 books! If you look at the larger picture you can see some of the pile they are working from on the table. Of course we had to pause to look at what Queen Elizabeth wore, they were fascinated by the layers of items she wore under the dress! I am hoping to get this done by the end of next week, they want to be a big part of it so it may take longer to get up then I hoped. I will keep you posted. 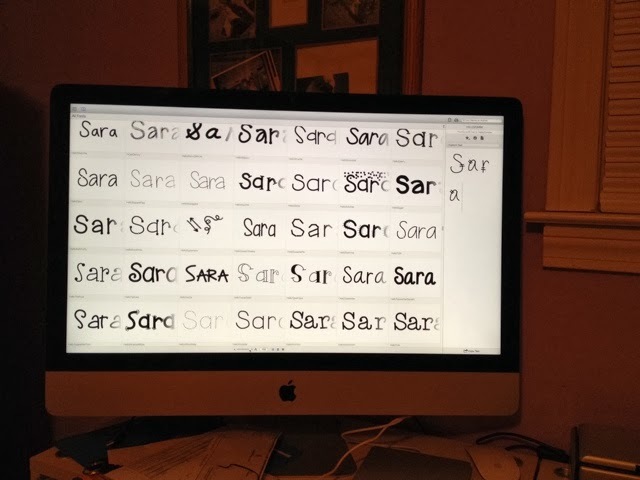 As we progress it will go up on Instagram, my name is sarabeth781 if you want to follow along. Of course my week isn't complete without my friend from upstairs hanging out with me after school at least once a week! That's it for this week, be on the look out for a freebie this weekend on the Space R-Controlled vowel sort. I will probably post it on Instagram! 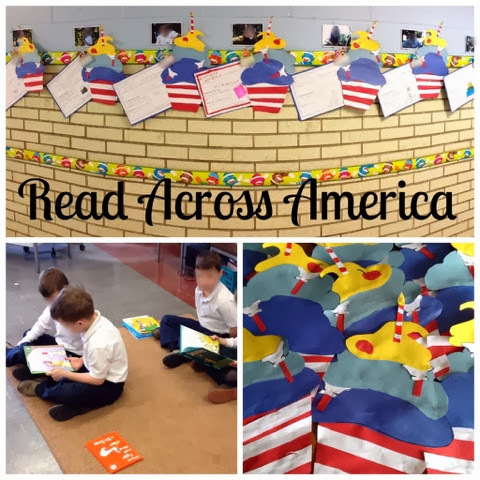 Check out Doodle Bugs Teaching and see what some other classrooms are up to this week! 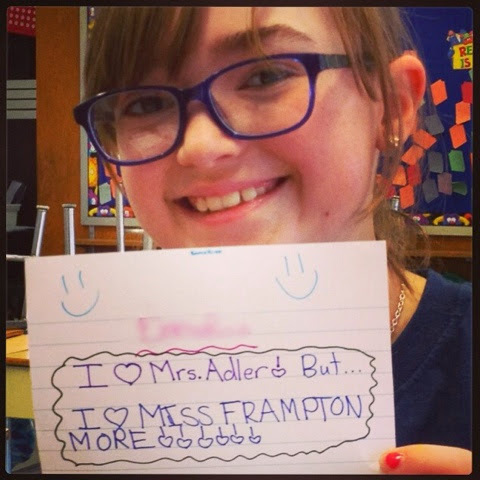 I posted a new product on my Teachers Pay Teachers site today!!! 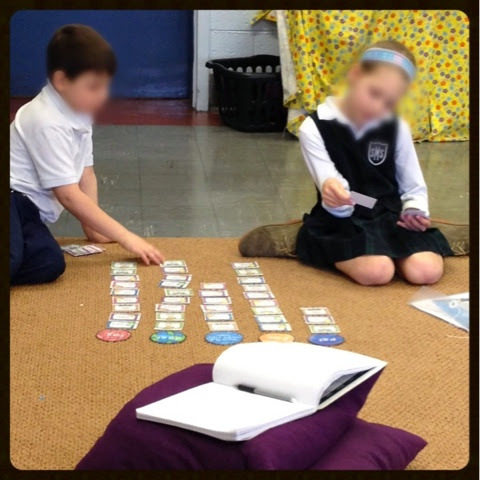 It is an adverb and verb sort. I am using it as a must do in my Daily 5 word work this week. 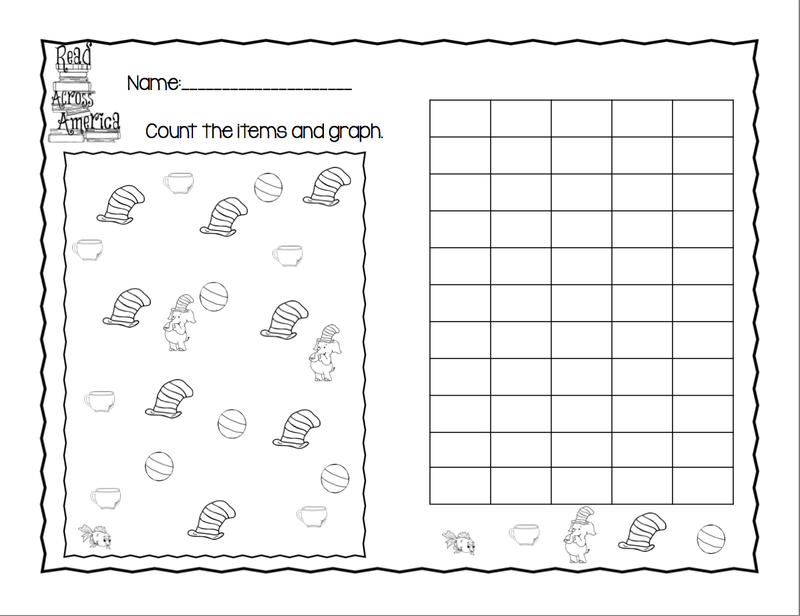 You can use it as a center, a small group lesson, an early finisher activity, or any way you see fit. So far my students are enjoying the activity. 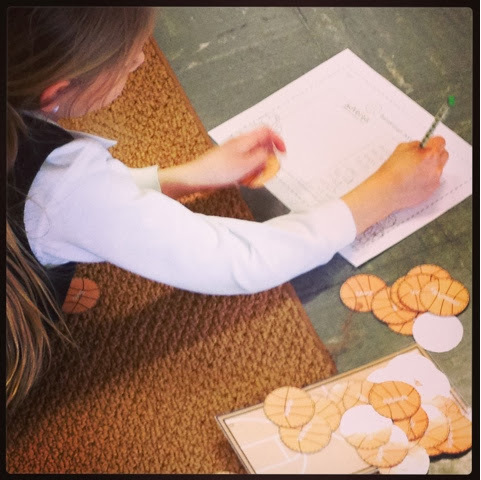 They have to sort the basketballs on the court, adverbs go on one side and verbs go on the other side. 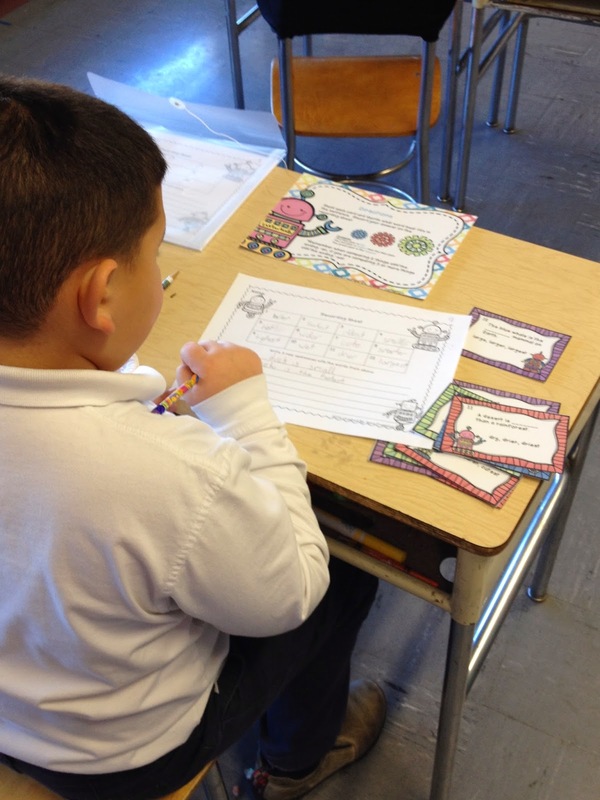 After they sort they need to record the words on the recording sheet and write 5 sentences on the back. I purposely had them record in boxes instead of lines so I can use as many basketball cards as I wanted to meet each students needs. 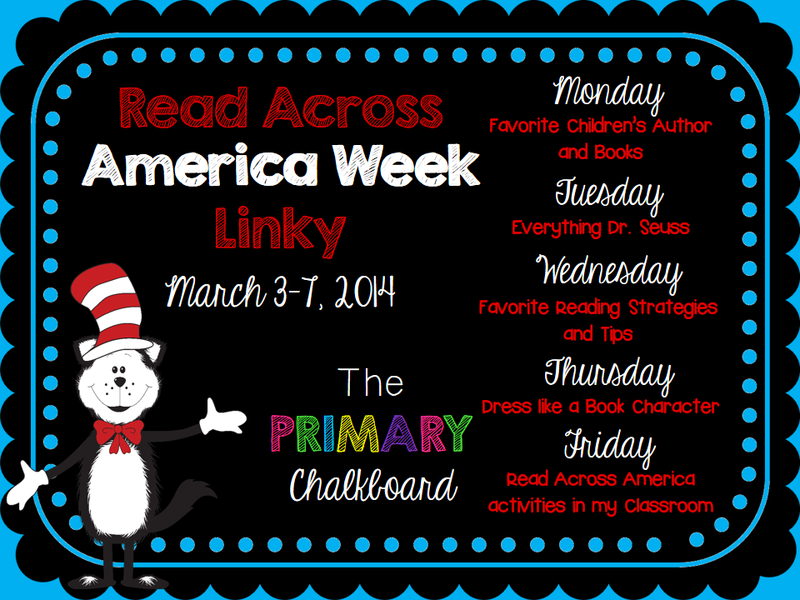 I also wanted to link up with Primary Chalkboard for the Read Across America Week Linky! I can't guarantee that I will be able to do every day, but I am going to see what I can get in. Today is Favorite Children's Author and Books. My favorite children's author is not one I read in my classroom. If the students have read it I will discuss it with them, but it is above my grade level. My favorite children's author is J.K. Rowlings, for many reasons. Not only are her books great, but she has been an excellent role model. She shows what hard work and following a dream can do. I discovered the Harry Potter Series when I was in college. I went to see the first movie with a friend, and they wouldn't tell me what happened next. So, I went home and borrowed my little brothers books and read them all in a week. After that whenever a new book or movie was to be released I would reread the series. I still will read, listen to, or watch Harry Potter when I need that comfy feeling. The amazing thing is before Harry Potter I HATED reading. I would do the bare minimum that was required and that was it, I could not stand sitting and reading. Since I was introduced to this magical world I absolutely love reading. I will even tell my students my story so they know it only takes one book to turn your life as a reader around. They know I now read whenever I can, and they know that I listen to books on my 40 minute each way commute to school. They think it is funny that I always have 3 books going, one paper, one digital, and one audio. I hope I can inspire them to love reading as no teacher was able to inspire me. They did try, I give them credit, but sometimes its the book that inspires! In my classroom I don't have a favorite author, I just can't pick. I do know we absolutely love reading in my room. I try to foster that love of reading and show my excitement about reading. I have found a new (to me) series this year that my kids are absolutely enthralled with. 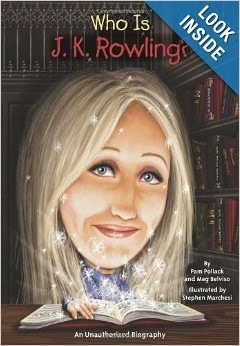 It is the Who Is series, yes I do have Who Is J.K. Rowling? in my classroom, and most of my students have read it because they know I love her. It is amazing how they come up to me with facts about her. I also love Apple so I have Who was Steve Jobs? and to be fair I have Who is Bill Gates?. I just love when they compare Steve Jobs and Bill Gates, I do point out that Jobs was nuts and Gates does wonderful things for humanity. They do love how Jobs was his own person and the products he helped create. I have now purchased over 40 of these books for my classroom, I can't help it, they are so excited. I don't know if my class is just that into non-fiction or if other classes will get into these books as well. If my next class is into them half as much as this years class it is still a win. This series is definitely worth a try! 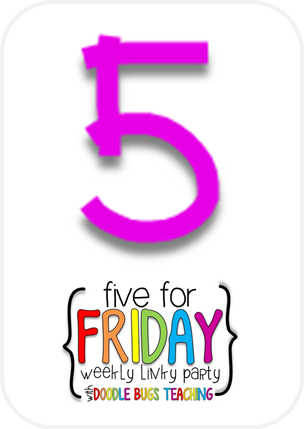 Today I am linking up with Doodlebugs Teaching for Five for Friday. I know I am late but you will see why in number 5! Last week I tried Jamberry Nails for the first time. 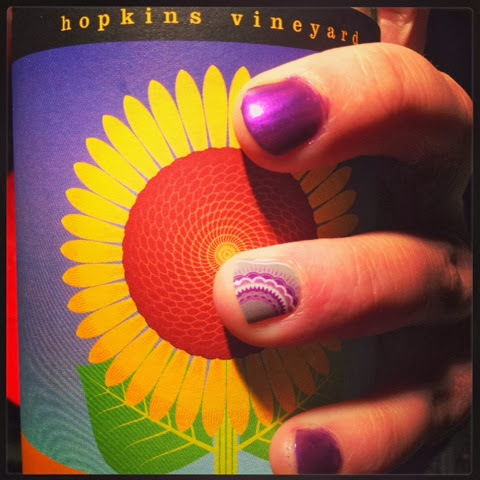 My girls have been bugging me all year to paint my nails, so when Marcy from Saddle Up for 2nd Grade posted on her instagram about a sample I replied. She asked that we take a picture on day 1 and 7, this is my day 1 picture, I will post day 7 on instagram (follow me @sarabeth781). I really liked having the Jamberry Nail, and the kids were so excited, even the boys tried to touch my fancy nail all the time. I also received many compliments from the adults I see. I still have them on and even my paint still looks good, evidently I didn't do many dishes this week. Even though I don't do my nails often I am thinking about ordering some because they were so easy to put on and it has been fun. I think I will continue to just do one accent nail, even though the Jamberry last a long time I don't really like having it on more than a couple of days, the week is killing me now. I loved having one "pretty" nail and the rest solid, I feel it made it stand out without being overwhelming with my "tomboy" style. Thank you Marcy for introducing me to Jamberry and please order from her if you are interested. Teachers Pay Teachers had a sale this week! I bought so much clipart, I can't wait to make things. I have been trying really hard to put more products up to sell, hopefully I will find time soon. I tend to make things for my class and then not complete them to sell. 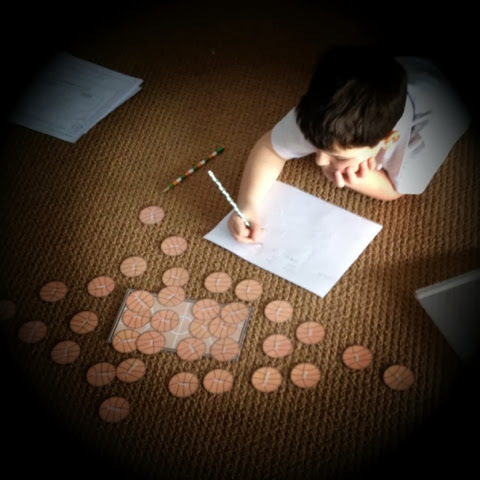 I am currently working on the space word sort. For my class I had review sounds from this unit, but I am altering it to sell with all r controlled sounds. Hopefully it will be done this weekend! I will post more details when I have it finished. 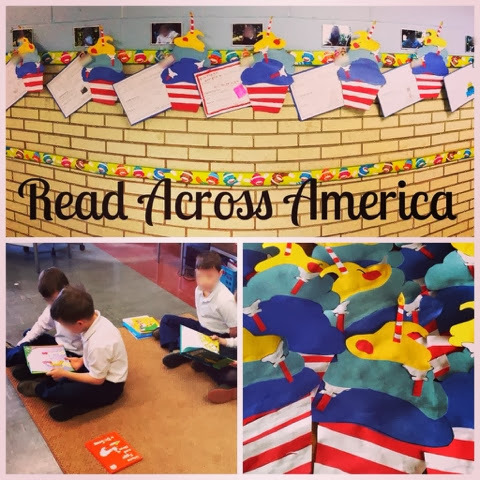 I love book day! This week our Scholastic Books box came. 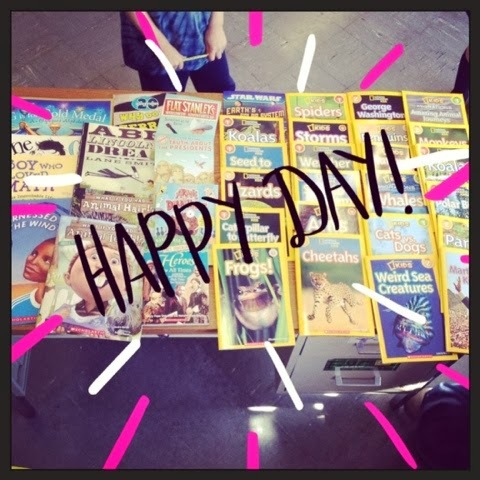 I just love how excited my friends are that there are new books in the classroom. For our classroom I got 36 new books. Most of them are the National Geographic leveled readers for our book bins. We like the leveled readers to practice our fluency, and I love the pictures in National Geographic so it is a win, win! The best part is I got all of these books for $4, I spent the $4 to move us up into the next reward level. We had many coupons and some points, I actually had my friends helping me decide which National Geographic books to purchase. They can't wait until Monday to go book shopping for their bins. 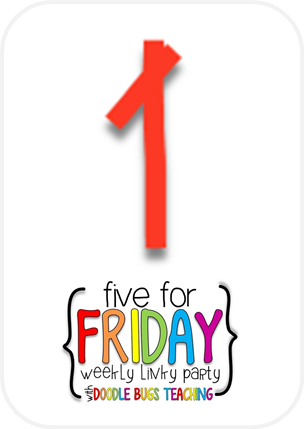 We had 5 whole days this week! I am pretty sure it is the first time this year, maybe even since Thanksgiving. It was a good thing too. 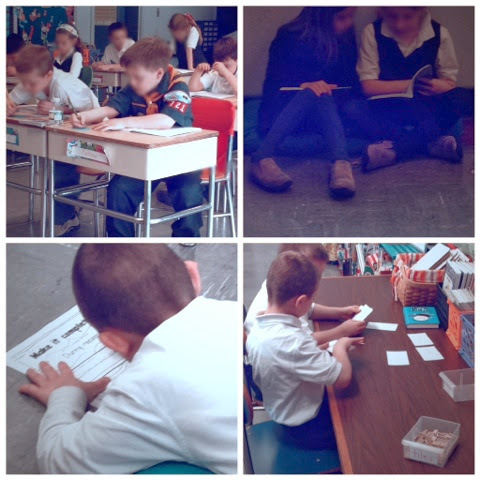 Next week is Ash Wednesday and the 2nd grade is responsible for the mass, so we needed to get to church to practice. We also had 2 afternoons of Olympic activities, and Friday afternoon was pep rally. So we had 5 days but the routine was still off, I'll take it. 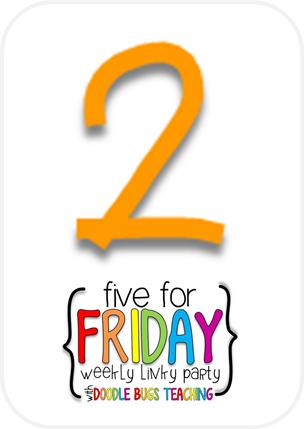 Hopefully, we will have it happen again next week, but already no because it is a half day next Friday for a teacher in service, and the weather is looking iffy for Monday :( Where are you spring? 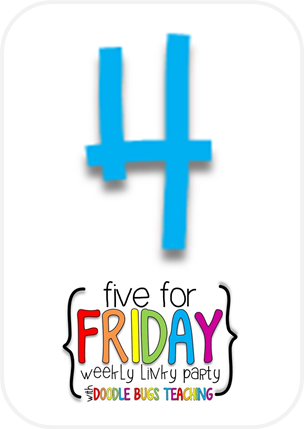 I am linking up for the first time with Farley's blog Oh Boy Fourth Grade for this months currently! I can't believe it is March already! Listening- It is very quiet here on a Saturday morning, so I only hear the sound of my two dogs feet on the hardwood floors. 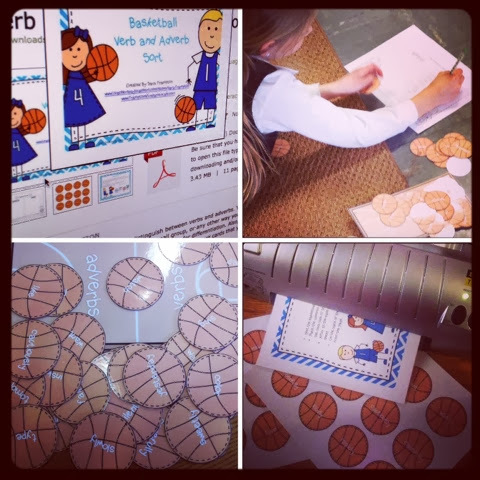 Loving- I love March Madness, at school. I have little interest in the "March Madness" college basketball. 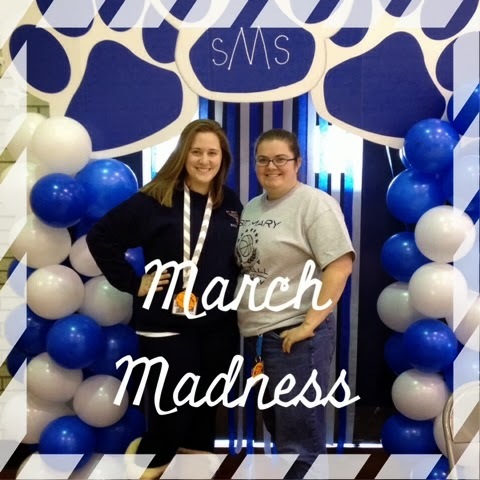 Our school hosts a basketball tournament every March, so for me that is March Madness. It kicked off yesterday with a pep rally and "fun night" where the teams from our school play their parents. Grades 3-8 have basketball teams for both the girls and the boys. Last night the girls played their mothers and the boys played their fathers. I was handed the microphone and announced all the games, from 4:15-9. Today my voice is very tired! Here is a picture of my grade partner and me standing in the arch that the 8th graders run through when they are announced at the pep rally. 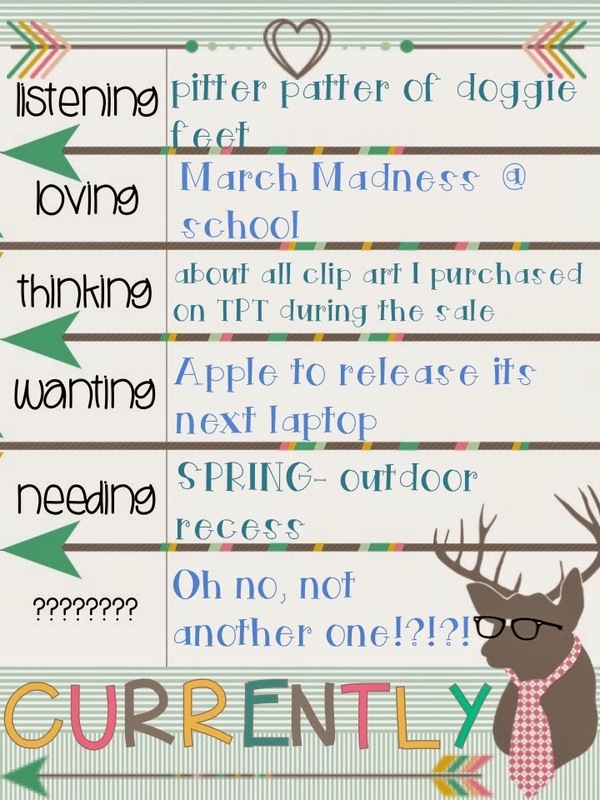 Thinking- I am thinking about all of the clipart I purchased during the TPT sale. 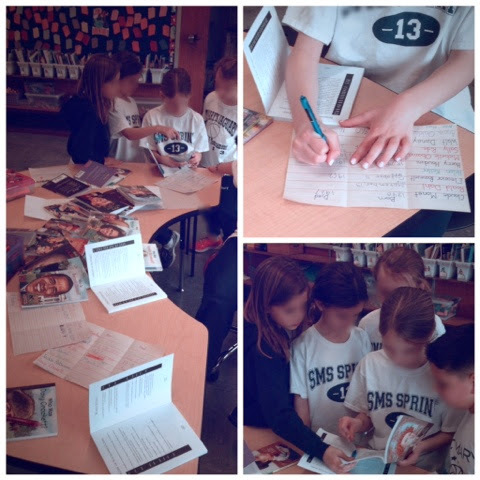 My students have already previewed it and put in their requests for activities. I just love when they ask me to make something with this clip art of that. 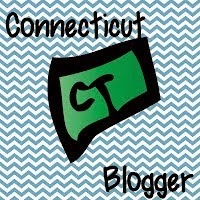 Hopefully I will get a chance to create some products for my TPT store! Wanting- I am dying for Apple to release its next laptop, I refuse to buy one towards the end of the product cycle. They typically announce in June, yikes. I gave my old laptop to my mom and was relying on my iPad on the go. At home I have the 27" iMac so I figured I was good. I was good for about a year, but I started creating all of these centers for my class and TPT and you can't do it on an iPad :( I am hardly ever home, so my boyfriend lent me his laptop to use for now, but its not a Mac and it is driving me nuts. I am very thankful to have his, even though it is a PC, but can't wait to be all Mac again! 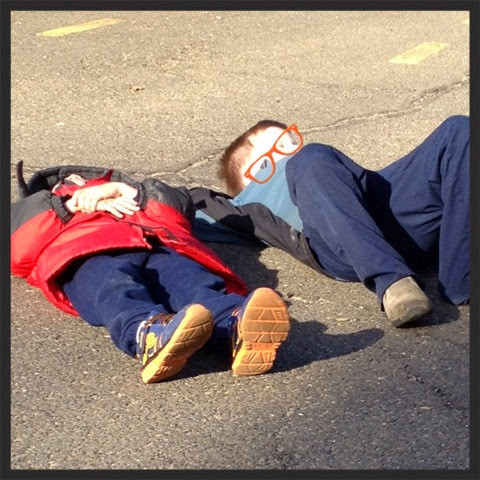 Needing- SPRING, or at least outdoor recess. The kids, and I are going nuts being trapped indoors. Normally we have some days where it is warm enough to get out at least a couple of times a week, but this winter has been cold, snowy, and bitter! ???? Oh no, not another one! That is the answer to my question, can you guess what I was asked? Leave your guess in the comments!